Celebrity artist and Bahamian Project portrait subject Jamaal Rolle was praised by actor Mark Wahlberg during a segment on ABC’s popular morning show “Live with Kelly and Mike”. Walhberg and his family were vacationing in the Bahamas earlier this month. During the live broadcast, Wahlberg discussed his time in the Bahamas and talked about Jamaal’s work. 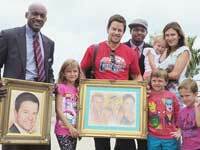 The portrait was presented to Wahlberg just as he was departing from Executive Airport. Wahlberg stars in the upcoming action flick Pain and Gain with Dwayne “The Rock” Johnson. Pain and Gain opens worldwide on April 26, 2013. The Bahamian Project portrait subject has also drawn portraits of other celebrities and prominent individuals including Prince Harry, Oprah, Sir Sidney Poitier, Michael Jordan, and photographer Duke Wells.